The Reusable Roof Ridge Tie off Bracket by Cleasby is a wise investment for any contractor that is looking for a great product at a great price. It is not necessary to weigh cost against safety factors, and fall protection cannot get much more affordable than with these roof tie off systems. Cleasby’s Reusable Roof Ridge bracket is heavy-duty and extremely durable. With this bracket you have the option to tie off on either side of the roof without having to reinstall or move the anchor. With a disposable bracket, they are designed for one time use, unfit for even a secondary install on a job. Constructed with two forged steel rings, 3/8 high-test chain and a 3/16 plate of steel, these tie off brackets can be installed on flat roofs or variable pitched roofs. 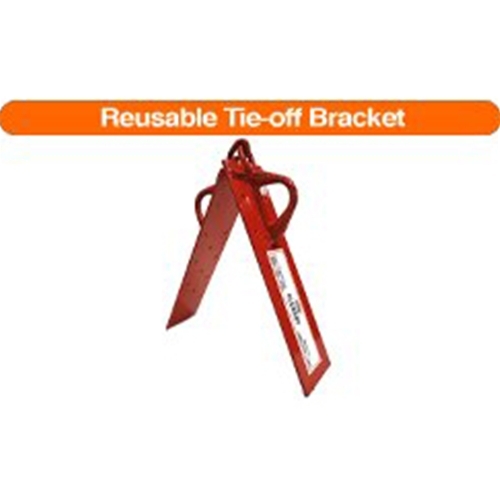 Weighing in at only 8 pounds, and easily affixed to the roof with 16D cement nails, this bracket can be easily transported and there is no hassle to reinstall. Exceeding safety standards from OSHA, the Cleasby Roof Ridge Tie Off Bracket effortlessly supports one person per bracket. Keep your crews and yourself safe in the field. Safety is all to often overlooked until an unfortunate event, and that is just simply unacceptable when affordable and reliable products are available. Plan your safety needs in advance with the pros at Intech Equipment. Depending on typical jobs, our experts can assist you in navigating through the product selections to choose the best fit for your crews and your budget. Shop Cleasby products as well as full lines of safety and personal protective equipment from all of the industry’s best in fall protection, eye protection, respiratory and more. Orders can be placed online or by phone, and with six facilities across the US we are available to you for extended hours to discuss, order and plan for the safe operation of your crews for years to come.